Get the peace of mind you deserve with help from our home chimney, masonry and pellet stove maintenance and repair services at Mr. Chimney in Cornelius, Oregon. We take all the proper precautions to protect you, your family and your home from the elements. ​We offer a full line of chimney services including chimney cleaning, chimney repair and chimney inspection to keep your chimney and fireplace working at peak efficiency. In addition to being the world's best "Chimney Sweeps" we also provide expert masonry services. Mr. Chimney can repair or rebuild your chimney or fireplace, but that's just the tip of the iceberg. Interior and exterior masonry projects like patios, retaining walls and adding a beautiful stone or brick facade to your home are just some of the quality masonry services we offer. And if you're looking to add efficiency and cost-savings to your home, our pellet stove services are unbeatable. We'll service, clean or repair your existing pellet stove or install a new or used stove in your home. We can even help you find the right model for your home and budget. And if you want an existing pellet insert removed from your home so that you can enjoy the beauty and excitement of a real fire in your living room, Mr. Chimney is the one and only expert you need to call. With nearly four decades of professional chimney and masonry experience, Mr. Chimney's team of master craftsmen is the only chimney services team you'll ever need to call. We're fully bonded, licensed and insured so you can trust that when we enter your home, you've got true and certified professionals on the job. Click any of the titles or photos above to learn more about the quality services we offer our customers. PROPER & REGULAR CHIMNEY CLEANING PROTECTS YOUR HOME AND FAMILY! 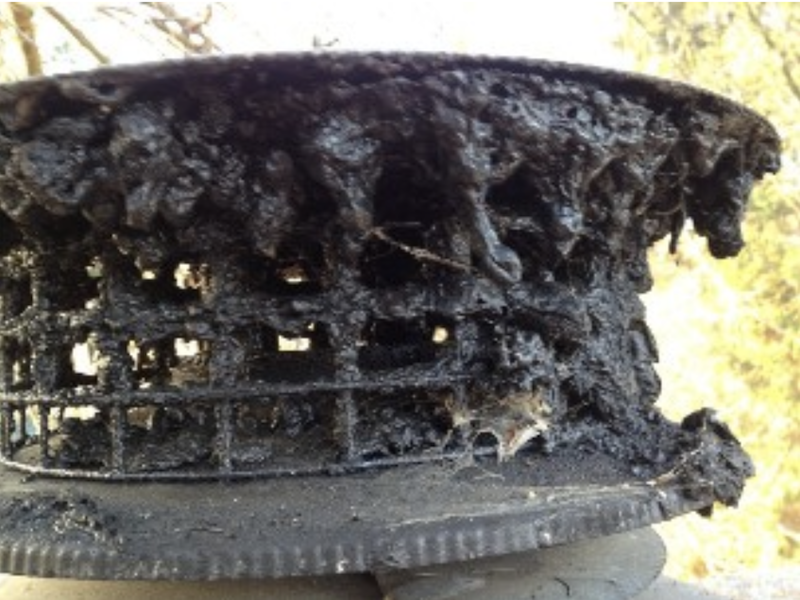 Creosote residue, nests, and other debris can build up on caps and inside chimneys, and removing this buildup is vital for preventing dangerous chimney fires from occurring to your home. When we come to your home to sweep your chimney, we first conduct a thorough inspection of the chimney top for cracks. Then our professionals make sure that the piping fits and that there is no brush or debris resting in the chimney caps. To finish, we inspect and clean the flue and fireplace, and because customer satisfaction is our number one priority, our staff always lays down drop cloths to keep your home clean while we work. In addition to cleaning and inspection to protect your chimney, Mr. Chimney can install a rain cap. A high quality rain cap maintains the state of your roof and prevents detrimental incidences from occurring. Rain caps prevent rain and other debris from getting into the chimney and prevent animals from making homes or nests in your chimney. We'll ensure your chimney is running at 100% efficiency with our home chimney, fireplace and pellet stove maintenance services. Mr. Chimney has provided Washington and Multnomah County home and business owners with expert residential and commercial fireplace, chimney, masonry, pellet stove and other heating system services for over 35 years. Located in Cornelius Oregon, we are perfectly positioned to serve the surrounding area. Some of these locations include Hillsboro Oregon, Beaverton Oregon, Portland Oregon, Tigard Oregon, Lake Oswego Oregon, Milwaukie Oregon, Sherwood Oregon, Newberg Oregon, McMinnville Oregon, Tualatin Oregon, and Forest Grove Oregon to name just a few. We serve many other areas, so please feel free to Contact Us to schedule a free consultation for your next home project. Many of our highly satisfied customers have shared their positive experiences from working with Mr. Chimney, and if you would like to see what some have said about our expert services check out our Testimonials page. You can also view Mr. Chimney’s Portfolio page for ideas on your next outdoor masonry or stonework project, fireplace rebuild or refurbish, and many other amazing photos of completed jobs. Mr. Chimney offers flexible contract terms and incredible customer service. Our experts are incomparably professional, reliable and trustworthy, as well as fully licensed, bonded and insured. Click the links above to learn more about our available services, or to schedule a repair or request an estimate, Contact Us. We'd love to discuss your next home improvement or home safety project. Mr. Chimney Provides Unbeatable Quality, Master Craftsmanship, Great Value and Outstanding Customer Service to Our Valued Customers within a 75 Mile Radius of Our Location in Cornelius, Oregon, with an Emphasis on Washington County, Yamhill County and the Greater Portland Oregon Metro Area.